WHO WE ARE: North America’s largest used car and finance company franchise brand with nearly 170 locations nationwide. WHO WE SERVE: Hard working people who need good cars and financing, but have been let down by traditional dealers and banks. HOW WE DO IT: We’ve packaged a strong brand image with a very successful business model and we back it with incomparable information technology, expert training, experienced support and solid marketing. HOW WE MAKE IT SIMPLE: We put the customer first. They get better cars, affordable payments, a better car care program and the chance to improve their credit…and their lives. When you take care of the customer business becomes much simpler. HOW THAT WORKS FOR YOU: You get the full support of a team that’s dedicated to making this system work. From site selection to car buying to driving traffic to your door, we’re there for you. But that’s only the beginning. After the sale, we provide the support and analytics that help keep your customers satisfied and your business on track. WHAT’S BEST: You get to be in the finance business, in a huge market with tremendous demand, with a company that’s the industry leader. Founded in 1989, J.D. 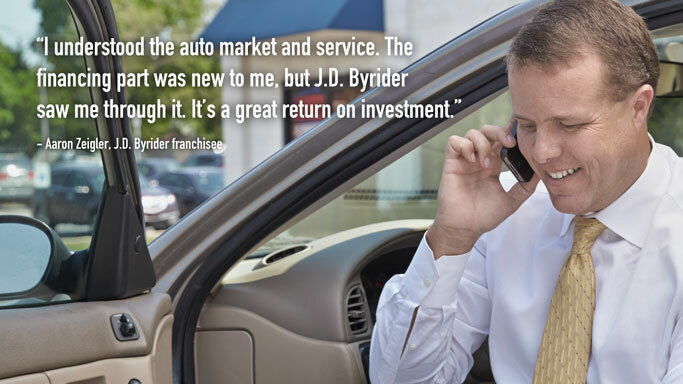 Byrider is the nation’s leading used car and finance enterprise. The company integrates vehicle sales and financing because it provides the franchisee greatest control of the business and the ability to sell to any customer they want or feel is qualified. It is the only franchise opportunity in America that allows you to become a “bank” or lender. The automobile retailer is no longer reliant upon a lender to make the sale, and the lender now has total control over the asset on which it lends. Being both offers a remarkable business model which may very well be the highest return on investment franchise offering in the United States. With more than 1 million consumers matched to quality, affordable vehicles, J.D. Byrider focuses on reliability and customer satisfaction. J.D. Byrider’s commitment to offer a better car, service that vehicle with a company warranty and help customers advance is not a common thing. J.D. Byrider sets the standard for the ethical treatment of customers in the industry as well as the way customer lending practices are handled. J.D. 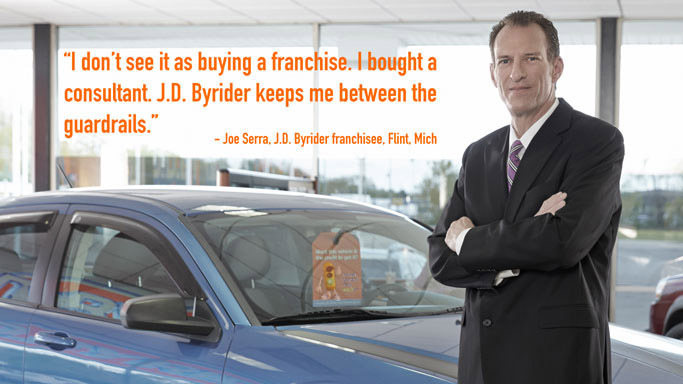 Byrider actively seeks qualified franchisees from varied backgrounds. Your ability to manage a team, hold them accountable and keep them focused on fundamentals of the business is the greatest indicator of potential success. Expert staff provide the training you will need in the technical aspects of the business and how to effectively use the company’s tremendous software model. How you put that training into application through an effective, high-energy staff will determine your success. It’s true that we’ve got a business model and support systems that are unparalleled in our industry. We also have a tremendous library of marketing materials that help position our brand at the top of our category. But, as a car company, there’s probably not a better endorsement than that of one of the America’s ultimate “car guys”, Tony Stewart. Not only is he at three-time NASCAR Sprint Cup Series Champion, but he’s also won Championships in the Indy Racing League and the United States Auto Club’s (USAC) coveted “Triple Crown”. The Byrider brand has also been cited as best in class by being recognized as one of the hot franchises in the country by Success Magazine, and on PBS’ The American Business Review. J.D. Byrider Founder, Jim DeVoe, Sr. also was presented with the coveted Ernst & Young “Entrepreneur of the Year” award. The J.D. Byrider Purpose and Values statements have helped shaped the brand through focusing on customer satisfaction. Our numbers are among the highest of any business in any category: 95% Sales Satisfaction and 91% Service Satisfaction. We have huge numbers of customers who are willing to refer us to their families, friends and co-workers. Skilled Professionals enhance the value of your investment. The executive team at J.D. Byrider is one of the most well-rounded franchise company management teams around. Over half the group has been on board for more than 10 years. The others bring a wealth of knowledge and experience in their areas of expertise. The franchise body recognizes this group as the most talented team in the company’s 25-year history.